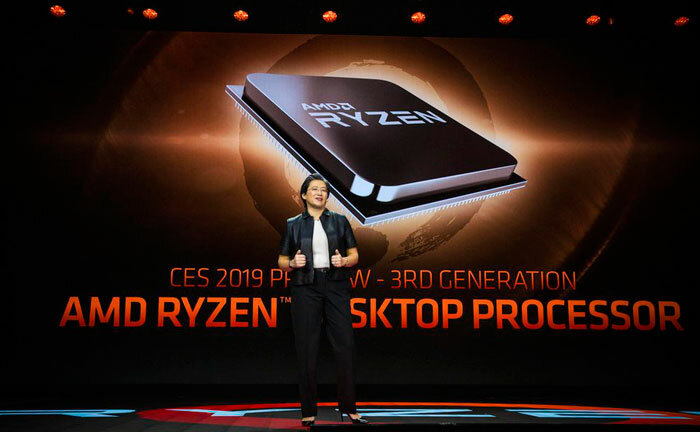 AMD announced its 2019 mobility line-up back at CES 2019, and the range detailed included Ryzen 3000 Series APUs for laptops. Meanwhile, PC enthusiasts who are interested in upgrading their systems are still waiting for the Ryzen 3000 desktop chips to be launched and become available. These desktop processors were only teased, rather than fully revealed, at CES 2019. Currently, rumours point to the Ryzen 3000 chips for desktops being delivered with up to 16C/32T. AMD CEO Lisa Su has strongly hinted that 3rd gen Ryzen processors will feature more than eight cores, and we have seen benchmarks of these AMD Matisse processors in up to 12C/24T configurations. AMD's Ryzen 3000 desktop series processors will a generation ahead of the Ryzen 3000 mobile processors, as they will be fabbed on a 7nm process, and use the Zen 2 microarchitecture. Zen 2 / Matisse is expected to deliver as much as a 15 per cent IPC improvement compared to the existing 12nm Zen+ Ryzen 2000 desktop processors available today. AMD might also be able to squeeze some more MHz / efficiency out of the range via the die shrink to 7nm production. Another good thing about Matisse is that it is expected to bring native support for PCIe 4.0. AMD has indicated that its Ryzen 3000 desktop processors won't be launched until mid-year, which usually means Computex. 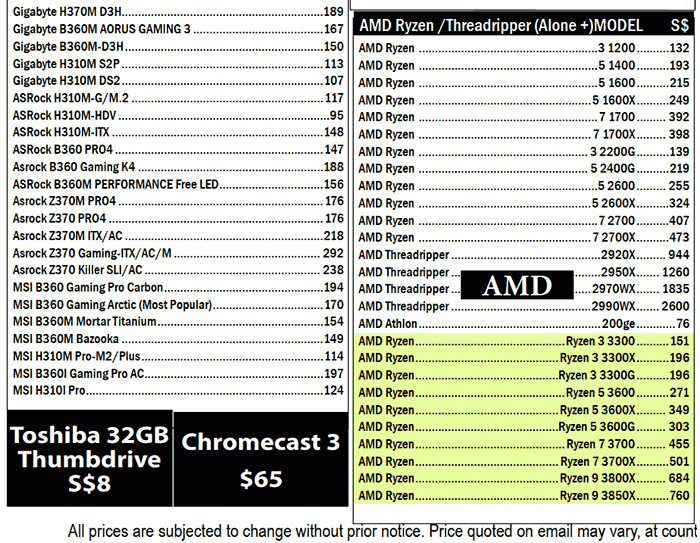 So it is surprising to see a price list include these processors so far ahead of time, but that is what has happened. Singaporean retailer Bizgram updated its PC component price lists (PDF) to include a range of processors at prices indicated below (I've roughly converted them to GBP, not sure about any VAT implications). Some sites are touting the cores/threads on offer in the above table to vary from 6/12 with the Ryzen 3 3000 parts, to 8/16 for Ryzen 5 3000, then 12/24 for Ryzen 7 3000, and the Ryzen 9 3000 parts to come with 16C/32T. At this stage its best to take these rumours with a hefty dose of salt. However, AMD seems to be going from strength to strength in the computer processor market and most would be very happy if the GPU market starts to sway the same way later this year.